Kauai and the rest of the Hawaiian Islands are geologically, geographically and biologically unique. The 132 islands, reefs and shoals that comprise the State of Hawaii extend for nearly 1600 miles from the “Big Island” of Hawaii on the southeast to Kure Atoll at the northwestern end of the archipelago. These dots of land are Earth’s most isolated islands, lying in the middle of the North Pacific Ocean some 2,400 miles from both the nearest continental land mass, North America, and other islands of Polynesia in the South Pacific. Metaphorically they represent the mere tips of the icebergs that lurk below. In this case the “icebergs” are huge mid-ocean shield volcanoes, some of the planet’s largest mountains, with their bases at as much as 16,500 feet, or more, below the ocean’s surface. The volume of the above-sea-level islands of Hawaii comprise only about 1.5% of the total volume of these volcanic mountains. In other words, as much as 98.5 percent of Hawaii is below sea level, a fact of which very few are aware. From a myopic human perspective, the islands of Hawaii represent one of the last habitable parcels of land on our planet discovered and occupied by our species. There is little or no direct evidence of human contact of any kind before about 900 C.E. The first significant “settlements,” made from the south by ocean voyaging Polynesians, were not established until around 1000-1200 C.E. Such was a consequence of Hawaii’s geographic isolation, itself a direct result of its geologic uniqueness. By the time the famous British explorer Captain James Cook “discovered” (in 1778) the islands he named “The Sandwich Islands,” estimates of human occupants were made to be well over half a million. Prior to human contact, the severely isolated islands were occupied predominately by plants, birds and insects, the vast majority being endemic. The lack of native flightless land mammals and reptiles, key elements of most Earth ecosystems, is just another testament to the uniqueness of Hawaii’s isolated islands. The impact of initial human discovery and subsequent population explosion was sudden and extensive. For humans to be able to survive in islands so severely limited in the resources necessary for their well being, many changes needed to be made. Human impact on the island’s fragile ecosystems intensified following European contact. The considerable effect of human occupation continues as present inhabitants strive to mold Hawaii according their vision of a marketable tropical paradise. From a somewhat more positive perspective, the islands provide one of the best places on Earth to observe and evaluate the interaction of humans with a complex of natural environments. Hawaii is the perfect natural laboratory, sort of a microcosm of the planet, providing learning opportunities for the development of improved methods by which humans can more effectively coexist with their natural surroundings. From a naturalist’s point of view Hawaii is a place where the main elements of the Earth’s surface and subsurface interact in a dynamic, and often dramatic, fashion. As new earth was created by the magmatic production of huge mid-ocean shield volcanoes on top of the floor of the Pacific Ocean, some eventually growing above sea level, the lithosphere (land) was brought into contact with the hydrosphere (ocean) and atmosphere (air and fresh water). Subsequently, prior to the appearance of humans, a unique establishment of the planet’s biosphere developed as plants and animals migrated to and evolved on these severely isolated islands. Over 4,300 species of land plants and animals (including 2,300 insects, 1,000 land snails and nearly 1,000 flowering plants) exist only in the eight high islands of Hawaii. Such native species are referred to as “endemic.” The indigenous founding species from which these endemic species evolved somehow migrated across more than 2,400 miles of open ocean, many with the help of birds, to the present islands, or to preexisting ones of the Hawaiian Ridge. Not surprisingly, no flightless land mammals are endemic to Hawaii. A single species of bat and the monk seal, which do spend some of their time on land, are the only known mammals. Again, the isolated geographic setting of the islands, established by geologic origin, has been the ultimate controlling element. 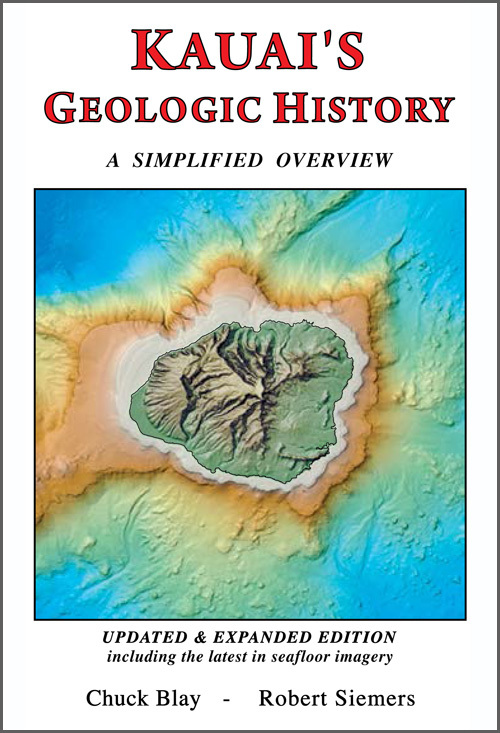 This book deals mainly with the earth science of that portion of the Earth’s lithosphere occupied by the Hawaiian Islands and even more specifically with the geologic history of the island of Kauai. The overview is organized loosely into four related sections. By design, only minimal text is provided. The numerous illustrations mostly are modifications of key technical diagrams derived from the geologic literature, although many are original and new. Captions have been simplified and expanded to enhance impact of the illustrations. The first section of the book provides an overview of the character and origin of the greater Hawaiian-Emperor volcanic mountain chain. For over the past 75-80 million years this string of gigantic shield volcanoes is postulated to have been produced as the Pacific Tectonic Plate moved persistently across a relatively stationary mantle plume, the thermal melting anomaly known as the Hawaiian Hot Spot. The second section of the book deals specifically with Kauai’s geologic history, its below sea level physiography, and the combined aspects of the Earth’s atmospheric circulation and Kauai’s morphology that generate the trade winds and produce extreme amounts of rainfall near the center of the island. That is followed by illustrations and interpretative text dealing with several of Kauai’s special places, specifically Waimea Canyon, Na Pali and Mahaulepu. Also included is an overview of the character and origin of the island’s beautiful sandy beaches. A final illustration, the Kauai/Earth Time Line, and Concluding Remarks present various aspects of Kauai, and the Hawaiian Islands in general, within a framework of the 10 orders of magnitude of geologic time. The Kauai Nui volcanic mountain-island complex, of which Kauai is the principal edifice, displays the oldest and geologically most mature high islands of the Hawaiian Archipelago – our planet’s most isolated major island chain. Isolation, along with location within the trade wind belt of the central North Pacific Ocean, establishes Kauai’s essence. Its geologic history, much of which is revealed herein, tells the island’s story. Controversy – is Kauai one or two shield volcanoes?